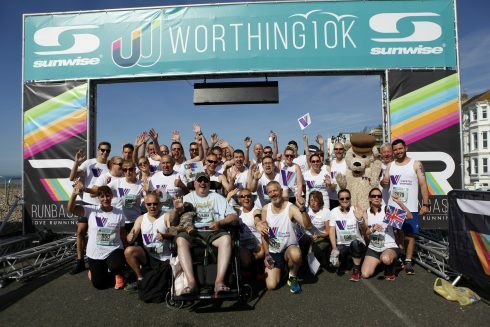 On Sunday 3 June, 55 runners took on the Worthing 10k in aid of local charity, Care for Veterans. The team, dubbed the ‘Fantastic Fifty’, included staff from Care for Veterans, family members of Care for Veterans’ residents, a serving soldier, and ex-Service personnel. Tyron Crayford, who is a resident at Care for Veterans, also took part and was pushed around the course in his wheelchair by four of the Fantastic Fifty. Care for Veterans, based at Boundary Road, Worthing, provides residential nursing care, rehabilitation, respite and end of life care to physically disabled ex-Service personnel and their family members. So far, the event has raised over £8,000 for the charity.